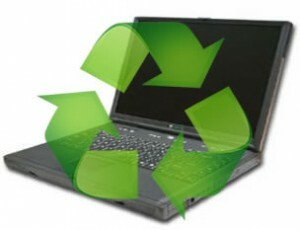 At the end of each year, students, faculty, and staff can safely and responsibly recycle personal computing equipment. Laptops, monitors, printers, and other computer peripherals are accepted. The main GreenUp program – for seniors, faculty, and staff – is May 30-31, & June 1st from 12:30-2:30pm at the Facilities barn behind the tennis courts. The Pre-GreenUp for underclass students only is May 20 & 21 from 10am-2pm at the main desk of Jesup Hall. Check the OIT website for updated info. What Can’t I Drop Off? Do not bring household items like TVs, VCRs, microwaves, etc. For college-owned equipment, contact the OIT helpdesk for information about proper disposal. For more info about cell phones, college-owned thermostats, and more, visit the Recycling Guide. Do not put any computer equipment in the trash. Computer have all sorts of toxins that are hazardous if disposed of incorrectly. Additionally, computers will have their hard drives removed and destroyed to eliminate the possibility of data theft. Equipment which can be reused will be refurbished by OIT and donated to local schools and non-profit organizations. The rest will be removed by a recycling firm. Recycling computer equipment is not inexpensive. OIT offers this as a free service to students and employees. For more information, visit OIT’s GreenUp page.